Roger joined BND Commercial as part of the Goldstine Knapke acquisition in August 2010. He began his career in commercial real estate in 1972 and joined Joe Goldstine and Son in 1976. His prior experience includes a career in banking with an Indianapolis firm. Roger has extensive experience in all aspects of commercial real estate sales and leasing, including office, retail, land and industrial/warehouse properties. He also provides consulting, investment analysis and tenant/landlord representation. Roger is a consistently high achiever, responsible for the most transactions at BND from 2012-2015. Roger graduated from Indiana University in 1967 with a Bachelor of Science degree in Marketing. 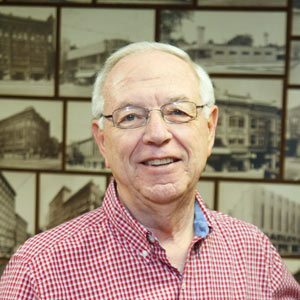 An active community leader, he is involved in numerous organizations, including the National Association of Realtors and the Indiana Commercial Board of Realtors (ICBOR). He has previously served on the board for Lutheran Social Services as well as Concordia Lutheran Church and School. Roger and his wife, Bette, have two children and two grandchildren. In his spare time, he enjoys gardening and traveling.